I went out to Fourth of July Beach this afternoon to conduct a COASST survey for stranded birds. There have been several seabird wrecks (an event where lots of live or dead seabirds strand) along the Oregon and Washington coasts recently as a result of a particular algal bloom. The species of algae that has been involved is Akashiwa sanguinea, which when tossed in the waves creates a soap-like foam that takes the waterproofing right off the birds' feathers much like oil does. 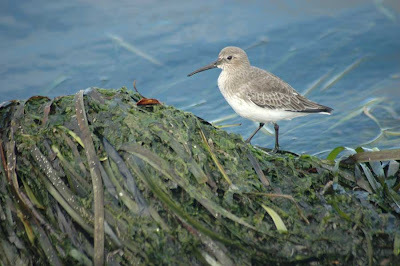 In some areas they've found as many as 40 stranded birds per kilometer. Luckily, it doesn't look like the San Juans are affected as I haven't seen any foamy looking water and there were no dead birds on my beach. There were lots of cool live birds though, and unlike last time where I left my camera in the car only to have a close encounter with some semipalmated plovers, I put it in my backback today. Out in the bay, there were both horned grebes and red-necked grebes diving in and among the flocks of bufflehead. All three are species are fairly common winter birds here. I also counted about six common loons, who looked very stocky compared to the grebes. The surf scoters weren't a surprise, but the 20+ white-winged scoters were. White-winged scoters are a more unusual sight than surf scoters, although looking back at my notes in addition to seeing them here last January I saw them last October, as well. The highlight today was the very cooperative pair of western sandpipers foraging along the beach. I couldn't pick just one favorite shot, so here are my top six photos. Normally I think of peeps as being pretty skittish, but this one let me approach it to within about 8-10 feet. It was high tide at the beach, and all of the exposed beach was covered in a thick layer of wrack (mats of seaweed). It made for difficult walking because in most places it was six inches or more deep and slippery. 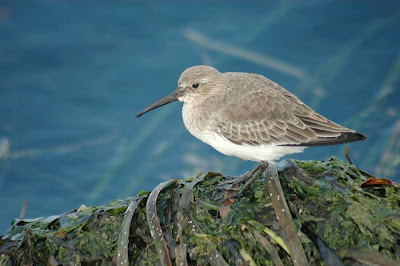 It was, however, covered with little hopping insects, which is what the sandpipers feed on. Yum! 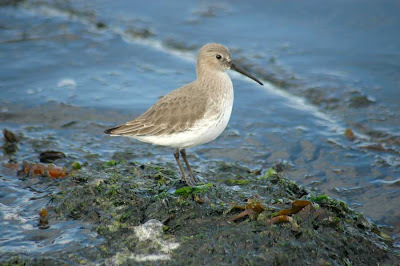 I always have a hard time differentiating the western and least sandpipers. It's a lot easier when you can get this close to them. 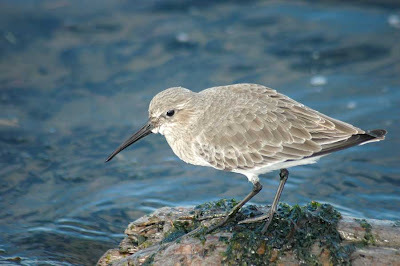 Note that it has dark rather than yellowish legs, and that the winter plumage is entirely gray with no brown. The black bill also has a slight droop at the end. Here's one in the process of ruffling its feathers. The sun also peaked out for a moment too, making the white a little bit too bright in this shot. Remember how a group of shearwaters is called an improbability? 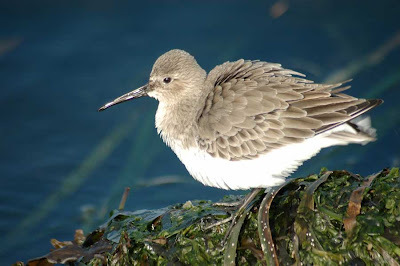 Well, apparently a group of sandpipers can be called a contradiction, a bind, or a fling. Who comes up with this stuff? 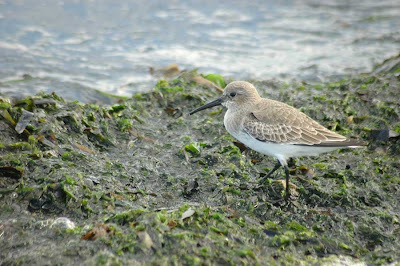 A fling of sandpipers is a nice description of a huge flock of them. The two pairs I saw today probably don't qualify, though. It was pretty special to observe these birds up close, and I like looking at the photos where you can make out every detail of the individual feathers. When I got back to the parking lot, one final bonus was a flock of golden-crowned sparrows. Once again, I love your pictures! Great pics Monika! That bird has cause a major twitch over here, in the past! Hi Monika your White winged Scoter is the elusive Velvet Scoter that is really succeeding in eluding me. Surf Scoter would be rather nice too. Your orcas moved on yet? Dave - Interesting about the velvet scoter! I looked it up on Wikipedia and it says the white-winged and velvet scoters are considered two different sub-species. 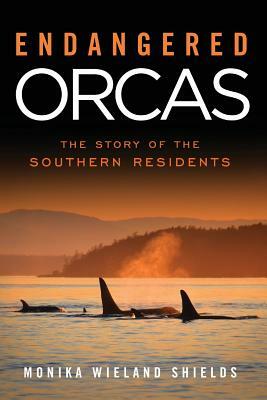 The orcas are starting to spend less time in the area. They've been through occasionally in the last two weeks but I've missed 'em every time, including today! I hope to get one more good look before the end of the season. Ah the splitters have been out in force again; your Black scoter is/isn't the same species as our Common Scoter - might be, might not...Great peep picks BTW either of those would sit nicely on my UK list. Our mystery duck has tentatively been ID'd as a hybrid between Mallard and Red Crested Pochard. Teal was out but I forgot to give a size indication - Wigeon sized - too big for Teal - sorry; but thanks for having a shot. Seen a few yankee G/W Teals and always promised myself finding a Blue Winged Teal..that'd be nice. More peep news please - oh and some more great gull pics too if I may be so bold. Closely related species/populations are always so interesting. Seems to be species are splitting and merging all the time so its really one big gray area regardless of where we draw the line! Bizarre find on the hybrid duck! I'll see what I can do about your gull request!